"I've started to move away from my friends, I've fallen in love with you, I'm in love"
The Turkish Final was held at the Istanbul Atatürk Kültür Merkezi on March 1st, hosted by Basak Dogru & Orhan Boran. The winning song was chosen by the votes of an "expert" jury, and only the top 3 were announced. One of the members of Mazhar-Fuat-Özkan (Özkan Ugur) previously took part in the 1978 Turkish Final in the group Karma. 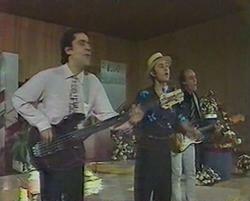 "Asik oldum" was renamed "Didai didai dai" for the ESC where it came equal 14th. Neco represented Turkey in ESC 1982.